The Ambassador Hotel was started 2 decades ago catering to the economical class tourists. It is built by the shore of Lake Anasagar. 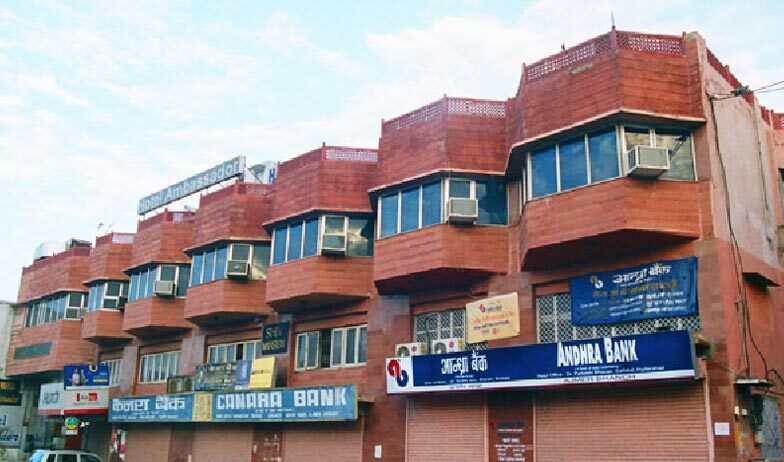 The hotel is just 3 km away from Ajmer Junction Railway Station and 1 km from City bus stand, while nearest airport is Sawai Mansingh International Airport Jaipur which is about 137 km from Ajmer. Hotel provides complimentary pick-up facility from Railway station and bus stand. The world famous Dargah Sharif of Khwaja Moinuddin Chishti and Baradari are at a walking distance from the hotel, Taragarh Fort is 4 km away, Adhai Din Ka Jhopda – the famous Hindu temple and Magazine the city museum are the places to visit in Ajmer. Frequent buses to Pushkar Lake which is only 8 km away are available. Being by the lake side, take an evening walk on Anasagar Link road. For recreational activities hotel arranges for Puppet shows, Folk dances, local sight seeing and Desert Camel Safari. You can also book this hotel for conference meetings, business events, weddings and other special occasions. Room Size: 160 sq ft. One Queen Size bed. Total 1 room. 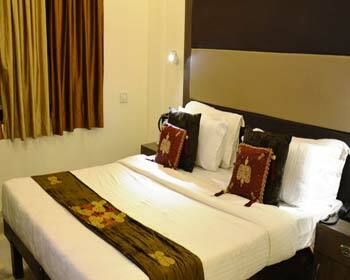 Standard room is the cheap bet to stay at Ajmer. It has air cooler (Non-A/c room) apt for single travelers and leisure travelers. Simple décor room has a double bed, a bedside stool and a rack. The use of wall paintings, soft mattress and bedside wall lamps make it a comfortable stay. The room windows open to hotel corridor. The complimentary facilities are – tea & coffee maker, internet access, LCD TV with premium satellite channels, tea& coffee maker and room service. The attached bathroom is equipped with basic bathroom toiletries. Room Size: 200 sq ft. One Queen Size bed. Total 12 rooms. Fully air conditioned Deluxe rooms are suitable for leisure travelers, single travelers and couples. 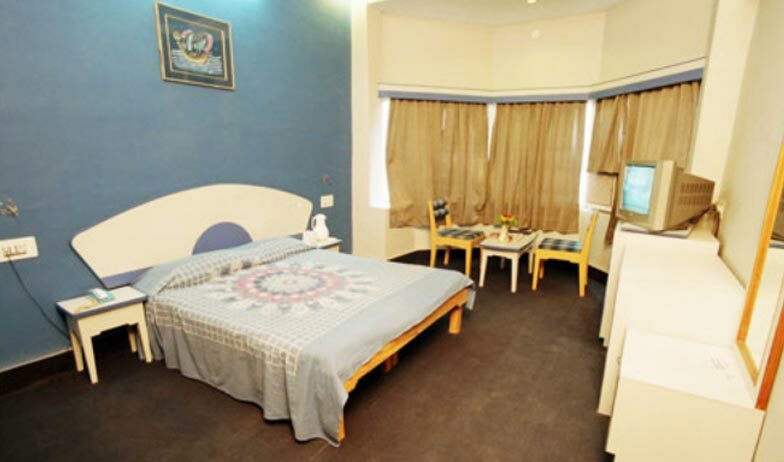 The adequate sized room is equipped with a double bed, a coffee table and a chair. The in-room facilities with your stay are – hi-speed internet access, LCD TV with premium satellite channels, tea coffee maker, small in-room safe, mini fridge and well equipped mini bar. Get round the clock room service and laundry service. The attached bathroom is equipped with basic bathroom toiletries and walk-in rainfall shower. 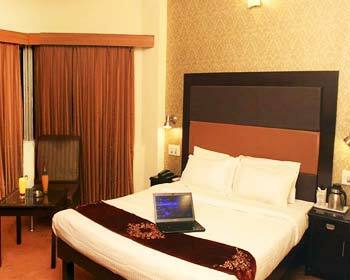 Deluxe rooms are given bold color theme with the use of curtains, furniture and décor. The use of bedside lamps adds warmth and welcome to this place. The room windows open to the city view and keep the sunlight intact. Room Size: 280 sq ft. One Queen Size bed. Total 10 rooms. 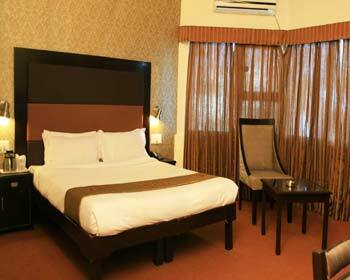 The spacious Super deluxe rooms are suitable for families or small groups to stay at Ambassador Hotel. 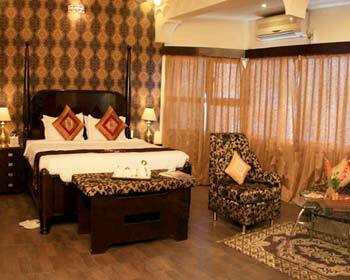 The interiors of the room are given brownish touch with carpet flooring, furniture, curtains and other décor. The room has a master bedroom, a sofa chair, bedside table and work desk. You also have the option to accommodate one extra single bed in the room. The room windows open to city view or sunset view over Lake Anasagar. While at your stay enjoy the amenities – cable television with satellite channels, complimentary internet access, tea coffee maker, in-room safe, laundry service, well stocked mini bar and 24 hr room service. The modern furnished moderate sized private bathroom has glass cubicle walk-in shower and well equipped with modern luxury toiletries. Room Size: 310 sq ft. One King Size bed. Total 3 suites. The Prince Suite is a contemporary European styled budget suite. 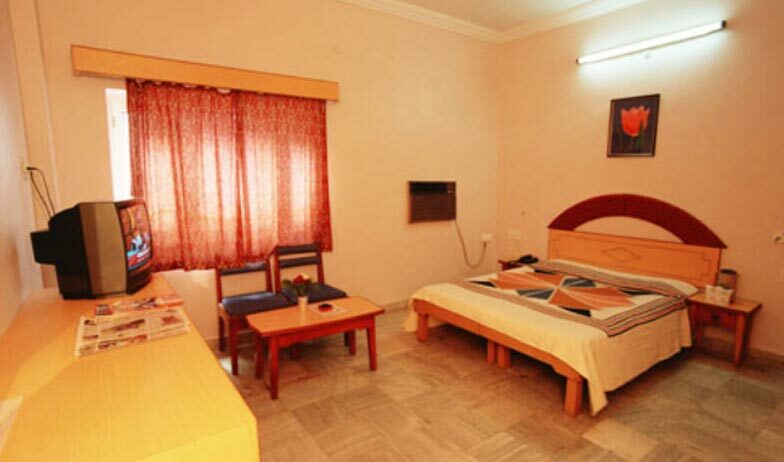 It is suitable for families to stay in Ajmer. One extra bed can also be accommodated. Fully air conditioned suite has a spacious bedroom with carved canopy bed, a large sofa, a coffee table, an executive work desk and chair. The suite is given a coffee color theme with carpet flooring, curtains and furniture color. Artistic wall artwork in coffee color adds charm to the room. Get comfort with the amenities – 24 hr room service, hi-speed internet access, cable television with premium satellite channels, complimentary tea coffee maker, mini fridge, laundry service, mini bar and in-room safe. Relax by the side of room windows that open to Lake Anasagar. Walk into your fully furnished private bathroom to use modern luxury toiletries and bathtub to soak in. You also have the option to choose bathroom with glass cubicle walk-in shower. 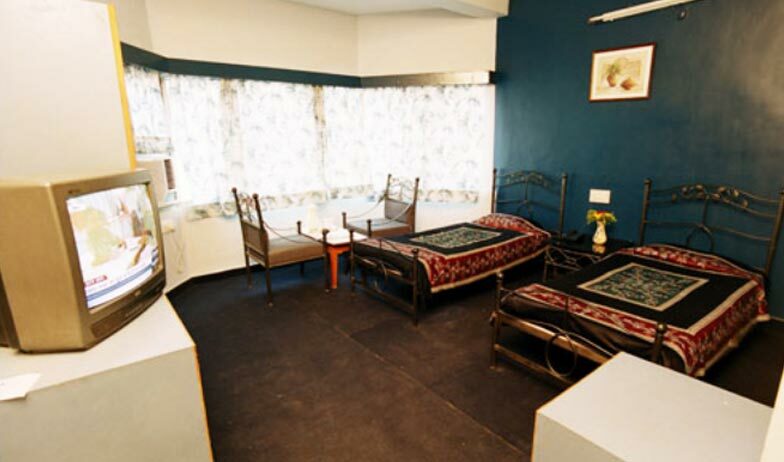 Room Size: 450 sq ft. One King Size Plus bed. Sole available suite. 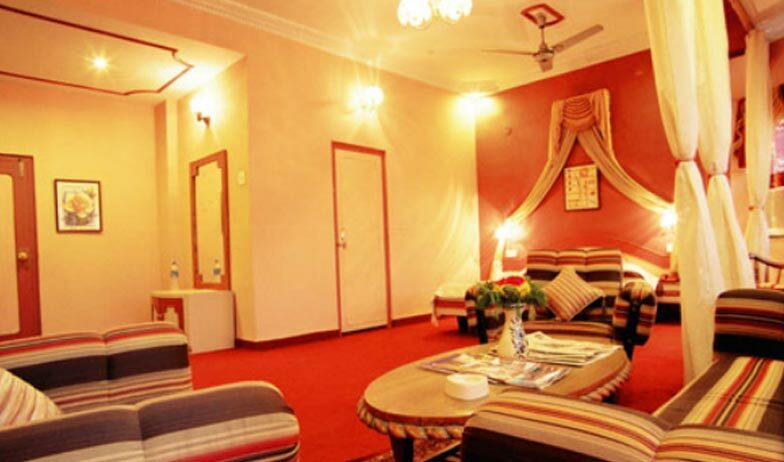 The Maharaja suite at Ambassador Hotel is a luxury home away from home. The suite has a spacious bedroom in wood colored theme on wood flooring, wood colored curtains, bedding, décor and wall artwork. The space is accommodated with 3 sofas having royal cover, a glass top coffee table, 4 poster double bed, executive work desk, bedside table and rich carpet. The large bay windows open to breathtaking sunset view of Lake Anasagar. The suite is suitable for business travelers and leisure travelers but can accommodate families too by adding 2 single beds. For your hospitality, you will have round the clock room service. While at your stay enjoy the amenities – cable television with premium satellite channels, hi-speed internet, fully air-conditioned, mini-fridge, laundry service, tea & coffee maker, mini-bar and in-room safe. The modern furnished extra spacious private bathroom has a bathtub and modern luxury toiletries. 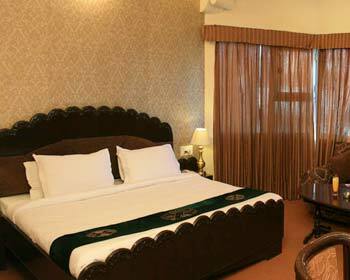 Hotel Ambassador Ajmer has 26 rooms which are furnished with a touch of elegance and given a classy look. 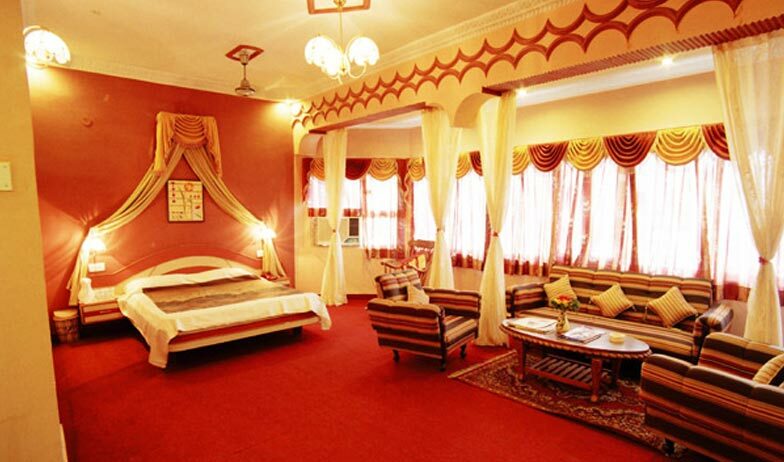 Each room reflects the grand lifestyle of Ajmer royalty. Prearranged with artistic furniture and traditional decor, the rooms at Hotel Ambassador are comfortable envelops of luxuries. Color televisions, telephones, room service and more form an integral part of the room amenities at the Hotel Ambassador in Ajmer. 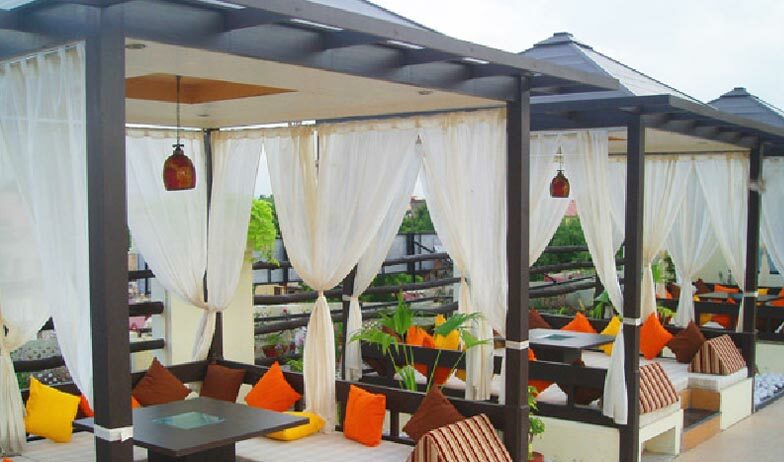 Ambrosia is the fine dining roof top restaurant at the hotel. It is know for its Indian and Rajasthani style of cooking, serving both vegetarian and non-vegetarian dishes from across the country. 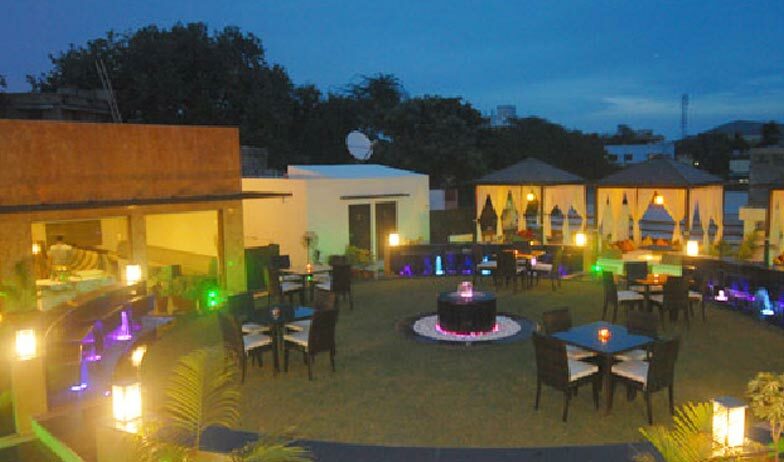 Ambrosia Restaurant offers you three types of dining choices to enjoy the evening among Aravallis. The A/C seating area is contemporary styled chic ambience eating arena with the beautiful touch of bamboo stick partitions. The garden sitting arrangement is another interesting place to book a table, surrounded with colorful plantation on lush green lawn. But the most talking style of sitting is the Arabic styled Cabanas. It is a 4 poster wood canopy covered with drapes and hanging lamp at the center. The colorful seating arrangements add charm to your evening.